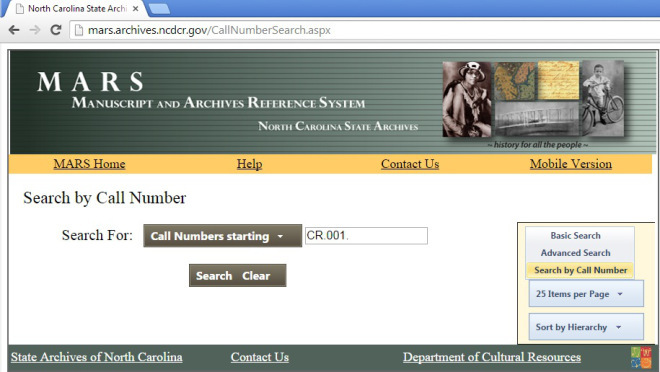 Carie Chesarino of the Records Description Unit (part of the Government Records Section) has written a post on our records management blog about how to search for county records by their call numbers in our online catalog, MARS. The County Records collection of the State Archives of North Carolina includes wills and estate files, tax scrolls, Superior Court judgment and minute dockets, and many more record series. In a previous blog post, I described one way to do a catalog search for archived county records. This post explains how to perform a call number search. This entry was posted in County Records, News and tagged County Records, Government Records Section, How To, MARS on December 29, 2014 by Ashley. In the mid-1980s the State Archives of North Carolina started work on preserving, microfilming and indexing the North Carolina Land Grants. I have not been part of this project since the beginning, but for the past 6 years one of my jobs has been to index the microfilmed North Carolina Land Grants into our MARS database, I have now indexed 133 reels of microfilm which is 25,899 land grants and I am very happy to say that the project is now complete. To give an idea as to the scope of this project there are over 200 fiberdex boxes consisting of 216,024 land grants which in turn became 611 reels of microfilm. North Carolina Land Grants span the years 1679-1959 and are arranged by county including the Tennessee Counties that used to be part of North Carolina. Prior to the indexing of these land grants, which consist of a warrant, plat and often a receipt, they would have to be taken out of their envelope “shuck,” flattened ,deacidified, and repaired in the conservation lab. From there they would be microfilmed and then finally indexing could take place. The indexing of the land grants required the ability to read the microfilm of old and at times almost illegible script. The information captured in this indexing was information found on the envelope “shuck” which includes the county name, name of the grantee, number of acres, grant number, date issued, warrant number, entry number, date entered, book number, page number, location, and remarks. The location field often required researching the names of the counties’, cities, creeks, rivers, branches, and other geographical locations. This process could be time consuming because not only might the handwriting be hard to read but in many cases the spelling would be wrong or the names of geographic features would have changed over the years as well. There were also times that the names of the people listed on the shuck would be spelled different ways within the documents and shuck. In those cases I would try to determine, as much as possible, the correct name. But indexing also had its upside, including finding many interesting or humorous names, such as Ice Snow or the all-time favorite among staff working on the land grant project, Bold Robin Hood. Although the process was long and tedious, this project will now enable researchers to view the North Carolina land grant “shuck” information online. Land grants can provide valuable information for many different researchers. Recently I learned that land grants were used to help reestablish the North Carolina-South Carolina border. Genealogists may also find information in land grants useful in their family research. Just remember that the information found in our MARS online catalog is the information found on the envelope, the “shuck,” at the time of the filming. If a researcher wants more information on the contents of the shuck they will need to visit our search room to view the microfilm, because the original land grants have been withdrawn from use as a preservation measure. Now that this project has been completed I am on to a new project. Keep an eye out for news about a new addition to the North Carolina Digital Collections. This entry was posted in News and tagged Genealogy, land grants, MARS, North Carolina Digital Collections, Preservation, State Agency Records on July 2, 2014 by tiffmaz. It’s been a while since I’ve done one of my catch-all blog posts to update you on everything going on in the digital side of 109 E. Jones Street. We’ve created new landing pages for War of 1812 Pay Vouchers, Modern Governors’ Papers, and Women, Marriage and the Law. We’ve begun loading World War II Posters online – that process should be completed in the next few weeks. Last month we added Longstreet Presbyterian Church Records to the Family Records Online collection. The item was added at the request of our Organization Records Archivist because the volume was fragile and she wanted researchers to be able to use it without damaging the original. It includes session minutes, member rolls, and baptismal records from Longstreet Presbyterian Church, Fayetteville, NC. One of our regular patrons recently wrote a blog post about researching land grants using MARS that you may find useful. Remember that we have online tutorials for MARS available on YouTube. I’ve updated our staff list to reflect some changes including reorganizations, retirements, etc. This entry was posted in Digital Collections, Digital Projects, News and tagged Genealogy, MARS, North Carolina Digital Collections, records management, United States Civil War, websites, World War II on May 9, 2013 by Ashley. A lot has been happening at 109 E. Jones St. in the past few weeks, so here’s a summary blog post to catch you up. First of all, please remember that the State Archives will be closed April 6-8, 2012 for the Good Friday holiday. The Search Room will be open to the public for its regularly scheduled hours on Tuesday, April 10th. If you ever need to know what our hours are, what holidays we close for, or how to find parking near the building, please visit the Hours and Parking page on our website. There is a new set of videos available on our YouTube channel; the five tutorials deal with social media in state government and give guidance on: how North Carolina state government agencies can utilize social media sites to reach citizens in new ways; acceptable use of social media; security concerns; and records retention of public records created on social media sites as well as the preservation of those public records. More tutorials and guidelines on these subjects are available on the Government Records Branch website. Also please remember that you can find video tutorials on how to use our online catalog MARS on our YouTube channel as well. If you weren’t able to attend the 1940 Census Release Party hosted by the State Library, you can get a good idea of the excitement generated at the event by watching this video from Raleigh’s WRAL. In connection with the release of the 1940 Census, the News and Observer published an article about the North Carolina Digital Collections (NCDC), a joint project of both the State Archives and the State Library and something that I’ve mentioned on this blog often. The NCDC is the home for our Treasures, Christmas materials, Civil War items, WPA cemetery surveys and Bible Records, World War I photographs, and so many other items from our collections, so it was wonderful to see the site get some recognition. And Bill wrote our First Wednesdays blog post for April about conscription in North Carolina. Finally, there is an updated version of the Guide to Newspapers on Microfilm in the North Carolina State Archives available in PDF format from our website. If you have questions about these or any other topics, you can always ask it in the comments on the blog or email us at: archives@ncdcr.gov. And if you want to keep up to date on the latest news from the State Archives, you can always follow us on Twitter. This entry was posted in Digital Collections, Digital Projects, Guidelines and Rules, News and tagged First Wednesdays, Genealogy, Government Records Branch, hours, MARS, newspapers, North Carolina Digital Collections, Preservation, public records, social media, State Agency Records, State Library of North Carolina, United States Civil War, video, YouTube on April 4, 2012 by Ashley.